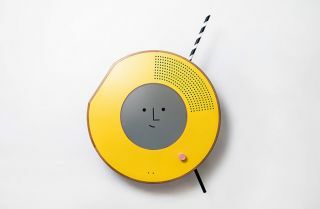 This radio reads your expression and plays music based on your mood | What Hi-Fi? If you're feeling blue, it might play a bit of REM, and if you're in a good mood, Outkast is the order of the day. The Amazon Echo might have a personal assistant to play your chosen songs, but the Uniform Solo radio goes one better - it reads your mood and plays music to suit your demeanour. The Solo takes a photo of your face and, using Microsoft software, reads your expression and creates an emotional breakdown, It's Nice That reports. It then assigns values of happiness, sadness or anger, and matches this to tracks using Spotify's valence rating (which attributes different moods to music). Hey presto! A tune to match your mood. Its little face even changes its expression to match yours. The Uniform Solo was launched at the V&A's Digital Design Weekend, as part of the London Design Festival. It's encased in wood, with a bright yellow frame around the screen and a stripy antenna. The aim is to start discussion around the potential of artificial intelligence to make our devices more empathic and human. "Solo opens up the conversation on how technologies can be broken down and mean something to people, not just the tech industry," said Mike Shorter, senior creative technologist at Uniform. "When you try Solo, you think not only about how technology is changing, but more importantly, how its relationship with us is changing."